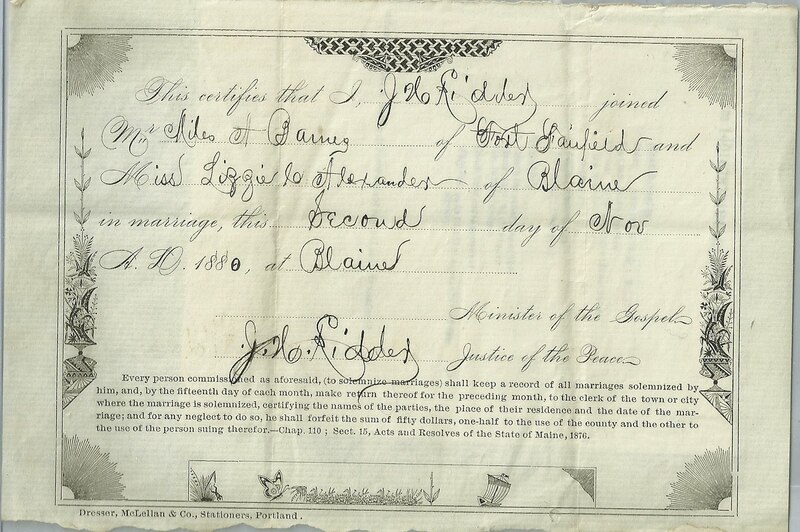 Marriage certificate issued by J. H. Kidder for Miles A. Barnes of Fort Fairfield and Lizzie C. Alexander of Blaine, on the occasion of their wedding of 2 Nov 1880 at Blaine, Maine. Fort Fairfield and Blaine are towns in Aroostook County, near the border with New Brunswick, Canada. Interestingly, an online source mentioned that Miles' grandfather was a Loyalist who moved to New Brunswick, Canada, from New York. At some point subsequent, probably in 1842 with the ratification of the Webster Ashburton Treaty, the border was changed so that his farm, or at least his house, was from then on located in the United States. Miles A. Barnes was born in 1949, the son of Joseph and Sarah (Kinney) Barnes. I've found some conflicting information on Joseph and Sarah and will continue researching them. Lizzie C. Alexander [actually Elizabeth Chloe or Chloe Elizabeth], the daughter of Joseph and Elizabeth (Shirley) Alexander, was born in 1857 in Fredericton, New Brunswick, Canada, and died in 1909. Miles and Lizzie had at least one son and one daughter. I hope you find this interesting! If you have any insights into the Barnes or Alexander families of New Brunswick and Aroostook County, Maine, please contact me.